When I was asked to paint some furniture for video tutorials and blogs I knew instantly I had to include modern pine! I get so many people asking about how to update their bedside lockers, headboards etc. and of course the ‘dresser.’  Some types of modern pine (not all) are really good quality furniture and although seemingly a bit dated now, they paint up so well, so much so that your friends and family will think you have a new piece of furniture! • Mini Roller tray and Microfibre sleeve. • Sandpaper and sanding pad for edges and grooves. • Methylated spirits for cleaning. 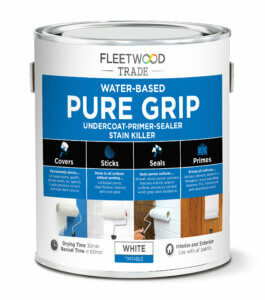 • Advanced paint range in an eggshell finish. Shabby Timeless. So let’s look at the pine dresser! 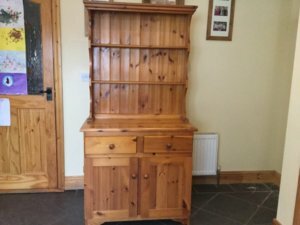 I put a call out on social media and a woman came back to me from Mountmellick and offered her dresser for a rustic revamp. You can see the yellowy pine with all the knots. Take a look at the AFTER photo and then I will tell you what I did……. Didn’t it turn out GORGEOUS !! The lady was absolutely delighted!! I cleaned it …. you must clean the furniture. I promise, even if you think it doesn’t need this, it does! Look at the dirt on my cloth in the video! 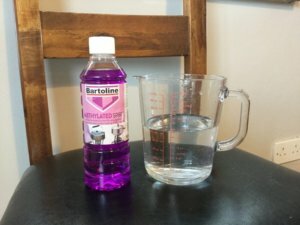 To clean i use a 50/50 mix of methylated spirits and water in an old shower spray bottle and sprayed straight onto the furniture. I then wiped with a sponge and kitchen towel to dry and remove all the dirt. In the video I show you how to cover your roller tray so you don’t have to clean it afterwards… thats a really handy tip when using oil based products! So now I have the whole unit primed … I would usually do this much in one day and leave it all to dry completely and then paint the second day. You can get it all completed within a day as long as you make sure you leave enough time for the products to dry. 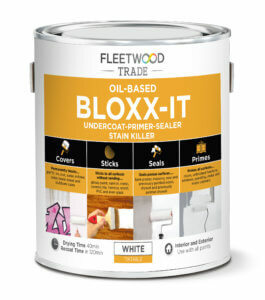 It’s 40min drying time on the Bloxx-It. It was time now to start rolling on my paint… Ah this bit I really love as you really start to see it all come together. 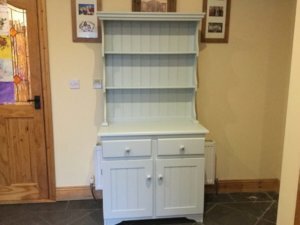 The colour chosen by the customers is from the Shabby.ie Colour Collection for Furniture called ‘Shabby Timeless’ and can be bought from the www.shabby.ie or in a Fleetwood stockist with a tinting machine. 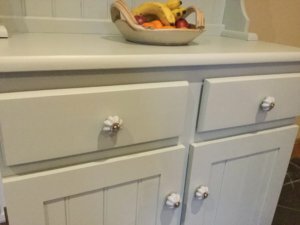 She also chose the designers choice for upcycling ‘Advanced Eggshell.’ This finish gives a lovely low sheen appearance on furniture. 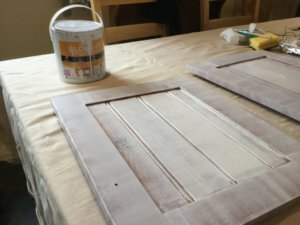 In the video you will see how easy the paint is to apply and the completely flat sprayed like factory finish you get. I used a Fleetwood mini foam roller to put the paint on and covered the table with a big dust sheet. 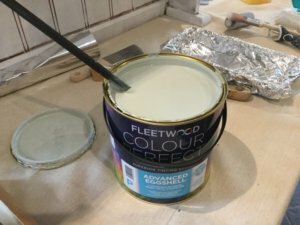 I raised the bottom of the dresser up of the floor on paint tins and this made getting to the bottom areas much easier…. What do you think of the finish ?? Would you give it a go yourself. I do hope so!